In January 2002, a dull star in an obscure constellation suddenly became 600,000 times more luminous than our Sun, temporarily making it the brightest star in our Milky Way galaxy. The mysterious star has long since faded back to obscurity, but observations by Hubble Space Telescope of a phenomenon called a "light echo" have uncovered remarkable new features. These details promise to provide astronomers with a CAT-scan-like probe of the three-dimensional structure of shells of dust surrounding an aging star. The results appear tomorrow in the journal Nature. 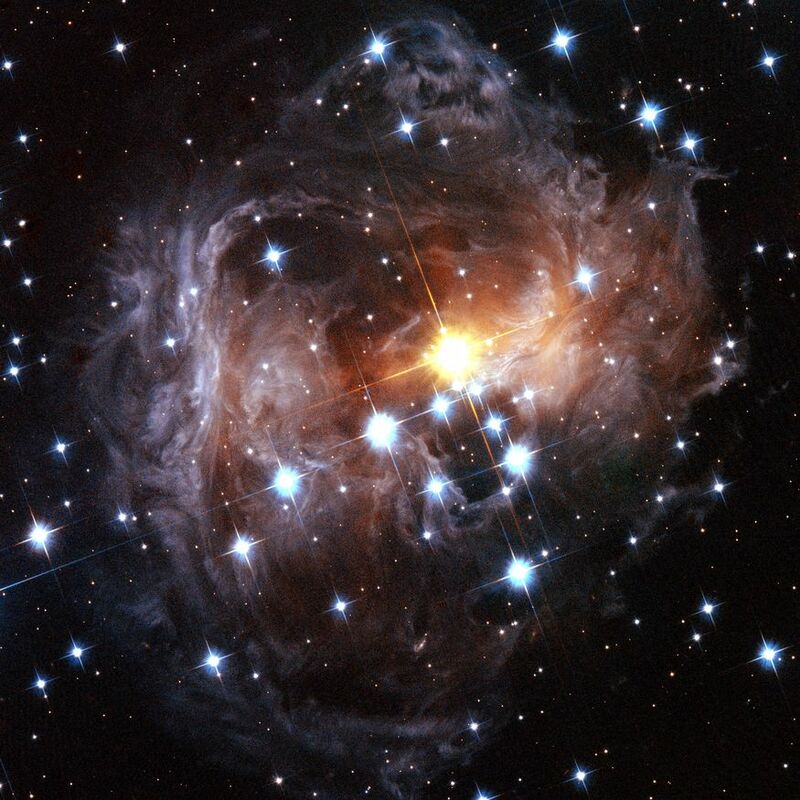 "Like some past celebrities, this star had its 15 minutes of fame," says Anne Kinney, director of NASA's Astronomy and Physics program, Headquarters, Washington. 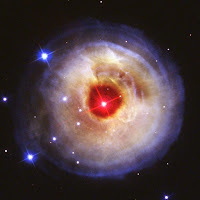 "But its legacy continues as it unveils an eerie light show in space. Thankfully, NASA's Hubble has a front row seat to this unique event in our galaxy." Light from a stellar explosion echoing off circumstellar dust in our Milky Way galaxy was last seen in 1936, long before Hubble was available to study the tidal wave of light and reveal the netherworld of dusty black interstellar space. "As light from the outburst continues to reflect off the dust surrounding the star, we view continuously changing cross-sections of the dust envelope. Hubble's view is so sharp that we can do an 'astronomical cat-scan' of the space around the star," says the lead observer, astronomer Howard Bond of the Space Telescope Science Institute in Baltimore. 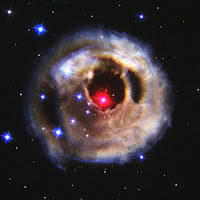 Bond and his team used the Hubble images to determine that the petulant star, called V838 Monocerotis (V838 Mon) is about 20,000 light-years from Earth. 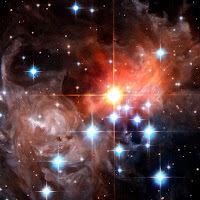 The star put out enough energy in a brief flash to illuminate surrounding dust, like a spelunker taking a flash picture of the walls of an undiscovered cavern. 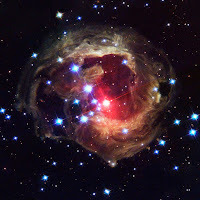 The star presumably ejected the illuminated dust shells in previous outbursts. Light from the latest outburst travels to the dust and then is reflected to Earth. Because of this indirect path, the light arrives at Earth months after light coming directly toward Earth from the star itself. The outburst of V838 Mon was somewhat similar to that of a nova, a more common stellar outburst. 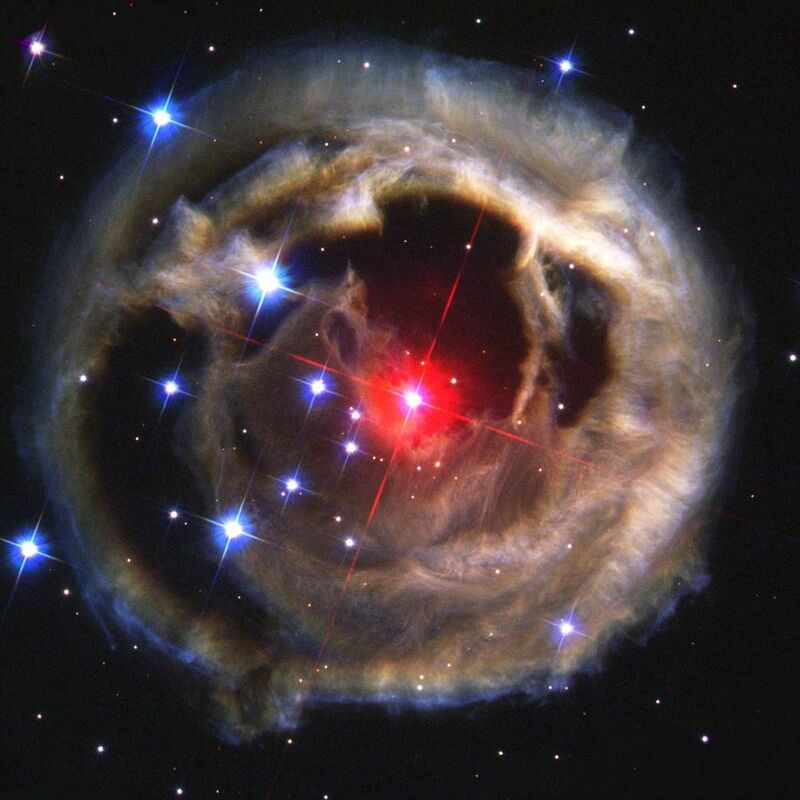 A typical nova is a normal star that dumps hydrogen onto a compact white-dwarf companion star. The hydrogen piles up until it spontaneously explodes by nuclear fusion, like a titanic hydrogen bomb. 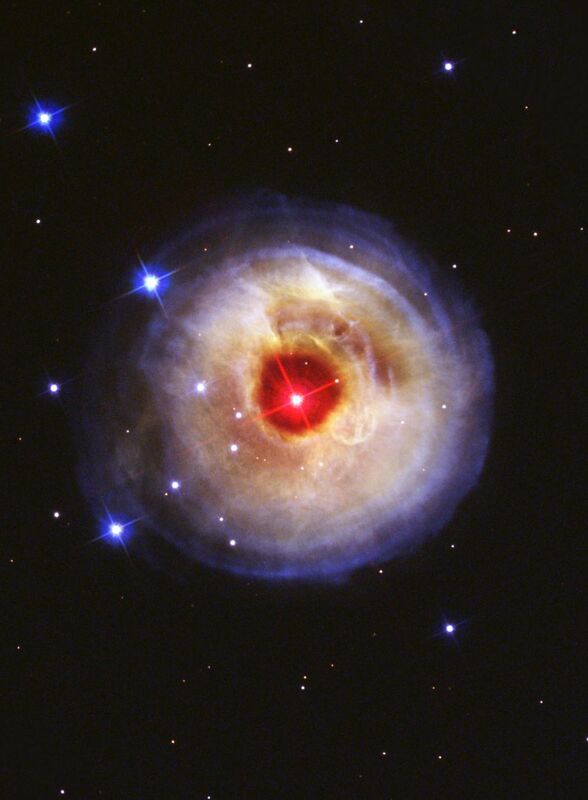 This exposes a searing stellar core, which has a temperature of hundreds of thousands of degrees Fahrenheit. By contrast, however, V838 Mon did not expel its outer layers. 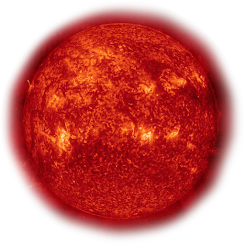 Instead, it grew enormously in size, with its surface temperature dropping to temperatures not much hotter than a light bulb. This behavior of ballooning to an immense size, but not losing its outer layers, is very unusual and completely unlike an ordinary nova explosion. "We are having a hard time understanding this outburst, which has shown a behavior that is not predicted by present theories of nova outbursts," says Bond. 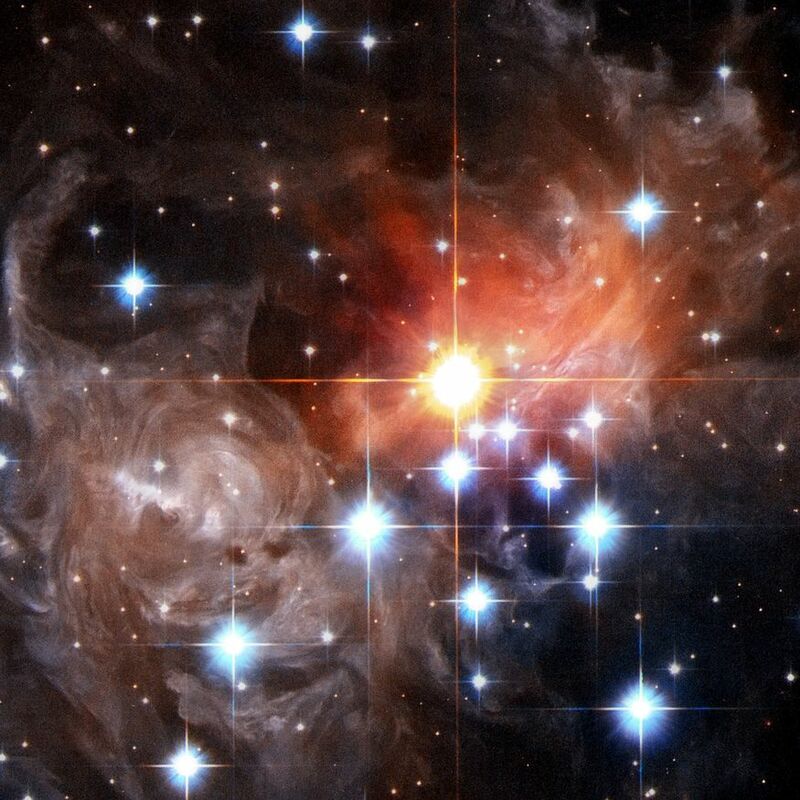 "It may represent a rare combination of stellar properties that we have not seen before." The star is so unique it may represent a transitory stage in a star's evolution that is rarely seen. The star has some similarities to highly unstable aging stars called eruptive variables, which suddenly and unpredictably increase in brightness. The circular light-echo feature has now expanded to twice the angular size of Jupiter on the sky. Astronomers expect it to continue expanding as reflected light from farther out in the dust envelope finally arrives at Earth. Bond predicts that the echo will be observable for the rest of this decade.